Strep throat is a common bacterial infection that typically affects children ages five to 10, although anybody can have strep throat. Other people are carriers of the strep bacteria, but do not show any symptoms. The most obvious sign of strep throat is a sore throat, and white or yellow spots can often be seen in the back of the throat. Those affected may also have a fever, loss of appetite, or headache. Most sore throats are caused by viruses, which the body will defend on its own without antibiotics. A sore throat which worsens or persists should be checked by a doctor. Occasionally, strep will show up in other areas of the body as well. 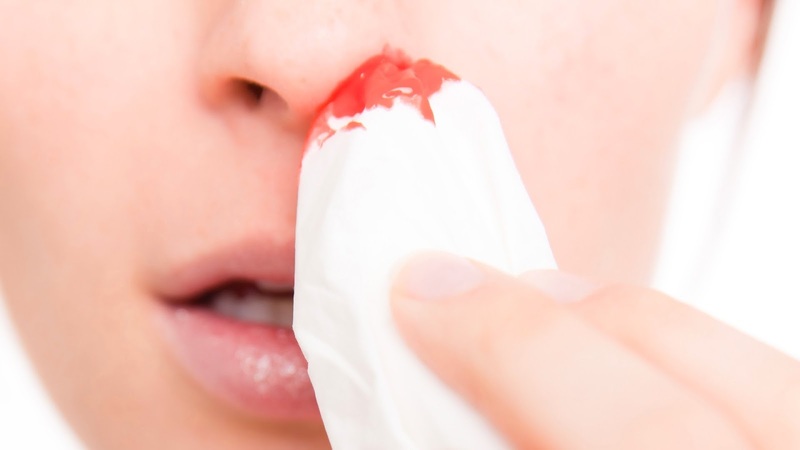 Strep (and usually staph) can live in the nose and cause pain and bleeding inside the nose. a rapid strep test done in his office. Results usually are ready in about 15 minutes. a longer test, if the rapid test is negative. This test, performed in a lab, takes one to two days before results come back. How Accurate is the Rapid Strep Test? If the rapid strep test comes back positive, a patient knows that he has strep. A false negative occurs in up to a third of the rapid tests, according to kidshealth website, meaning that the patient has strep but the rapid test showed a negative result. This is why the second culture is often sent off for the longer test, and doctors will call when they get the result of that test. Antibiotics are usually prescribed for patients who have a positive strep test, which will take care of the strep as well as eliminate the chance of further problems from the infection, such as meningitis or pneumonia. It is important for patients to finish the entire course of antibiotics even if they are feeling better before they are done with the antibiotics. Strep throat is contagious, so patients should avoid contact with an infected person. As with all viral and bacterial infections, frequent hand-washing can help prevent the spread of strep throat. Streptococcus infections are a nuisance, but with a simple test, and a doctor's diagnosis, a patient will be feeling better following a short course of treatment. Diagnosing IBS can be a lengthy and complex process, as no actual test for IBS exists. Many disorders of the stomach or bowel often have similar systems to IBS so must therefore be ruled out before any final diagnosis is made. When a patient consults their doctor with symptoms of IBS, the doctor will often refer the patient for tests for conditions such as coeliac disease, Crohn's disease or ulcerative colitis. Occasionally in more severe cases, the patient may even be referred for a colonoscopy, an exploratory procedure of the bowel. Only when all other possibilities are ruled out can there be a diagnosis of IBS. Any abnormality in bowel movement or stools can be a sign of IBS. The main symptoms of IBS are abdominal pain, often described as colic-type pain, stomach cramps, bloating, diarrhoea, constipation, flatulence and an urgency to go to the toilet. Other symptoms can include lower back pain, nausea, headaches, tiredness, mucus in stools and feeling particularly full after eating. Symptoms can vary depending on the person. Some people may only have a few symptoms and have periods where the symptoms flare up occasionally. In more severe cases, IBS can be debilitating for the individual and has a profound affect their daily lives. It may prevent the sufferer from being able to go to work or do anything. Frequent flatulence in public or a sudden urgency to use the toilet and not being able to make it to the toilet on time may also be present and can be extremely traumatic on the sufferer. The cause of IBS is unknown; however, there are many theories to what causes the condition and triggers symptoms. The most popular theory is related to diet, primarily because food consumed has a direct impact on the gastrointestinal system. Food intolerances and certain foods which has a direct effect on the digestive system may trigger symptoms of IBS. There is a theory that IBS sufferers have a colon or large intestine, that is particularly sensitive and reactive to certain foods, and also to stress. Evidence has shown that there is a connection between IBS and stress or anxiety. Many sufferers relate symptoms to stressful events in their life. The relationship between the gut and nervous system is complex and it has been claimed by many studies that there is a part of the nervous system in the gut. A bacterial infection in the gut is another popular theory for being a cause of IBS. 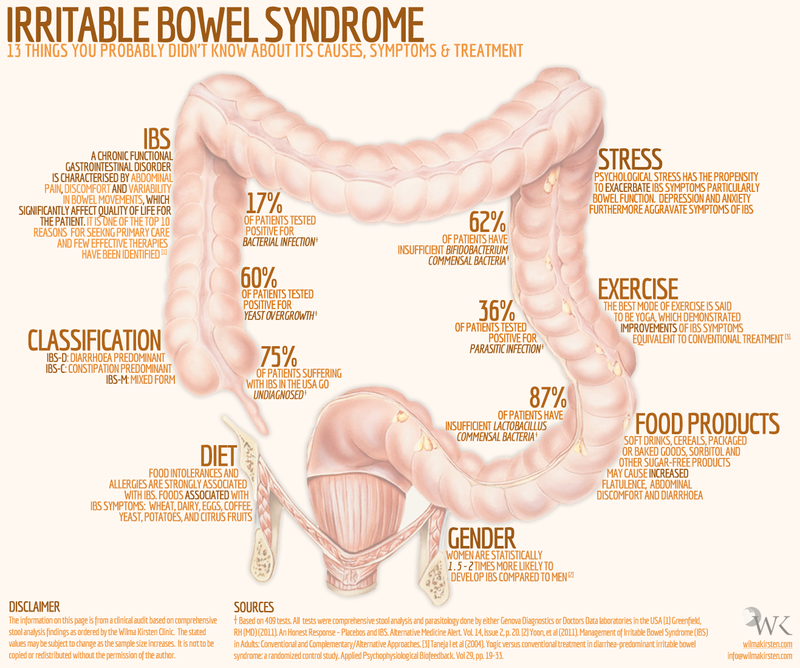 Treatment for IBS symptoms can vary and depends on the individual. What is considered effective for one individual may not be as successful for another. There is no actual treatment for IBS, but there are many methods which are recommended for treating the condition. One recommended method is consuming probiotics. Probiotics are found in dairy products such as yoghurts and cheese, or can be bought in capsules. They are nutritional supplements that contain good bacteria which lives in gut. Limiting consumption of spicy or rich foods, caffeine, and fizzy juice or alcohol is also highly recommended. Other recommendations include regular exercise, drinking plenty of water or herbal teas, peppermint tea or peppermint water, and decaffeinated drinks. Peppermint and oat-based foods like porridge, oatcakes or oat-based cereals are good for bloating. Anti-spasmodic medicines relax the wall of the gut and relieve pain and discomfort caused by trapped wind or inflammation. Treating each symptom separately is also effective. Relaxation and complementary therapy techniques such as yoga and avoiding stress as much as possible will also help ward off IBS symptoms. As anyone with any experience of IBS can testify, living with IBS is not easy but understanding and monitoring lifestyle and diet is a highly effective way of relieving symptoms and coping with the condition. It is recommended that when and how often flare-ups start be recorded in a diary and shown to a doctor as evidence so the symptoms can be more readily treated. A food diary is also recommended so that any any particular foods or drink that triggers an attack can be identified and known to be avoided in the future. Defined as having difficulty falling asleep or staying asleep, insomnia affects 58% of U.S. adults, according to the National Sleep Foundation. Women are more susceptible to insomnia than men, and occurrences seems to increase with age. Those in lower socioeconomic groups appear to have an especially high incidence of insomnia, as do alcoholics. Many people experience an occasional day or even several days of insomnia, where sleep just won’t come, no matter how tired they are. This is known as “transient insomnia” and typically lasts for less than one week. With “acute insomnia,” sleep difficulties last slightly longer, but less than a month. Sufferers of “chronic insomnia” are unable to sleep or to sleep enough most nights for more than a month, to the point where it is affecting their relationships, their job and their wellbeing. 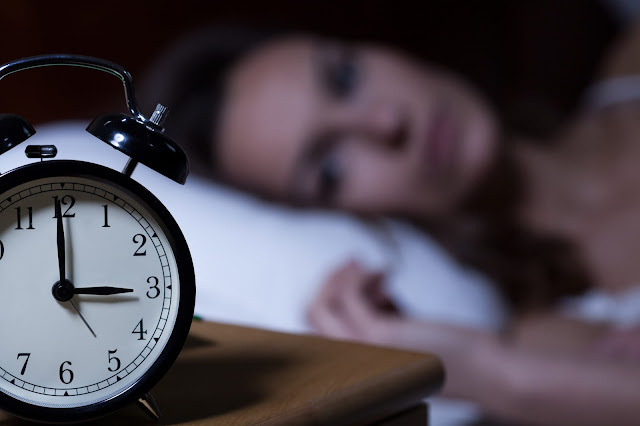 Insomnia can be caused by certain medications, by a sleep disorder such as sleep apnea, by another condition such as menopause or asthma, or even by having too much caffeine. All of these causes are what is known as “secondary insomnia,” and most people with insomnia have this form of the condition. When there is not a separate medical cause of sleep problems, a patient is said to have “primary insomnia,” which occurs in only about two in ten cases, according to the National Institutes of Health. Shift workers or anyone keeping a schedule that results in widely varying bed times are frequently plagued by primary insomnia and stress is believed to play a role in this type of insomnia. For those with acute insomnia, lifestyle changes may be enough to help relieve the occasional sleep-related problems. That is likely not the case for chronic insomnia, however, which may require some other form of intervention, including pharmaceutical treatment. Cognitive-Behavioral Therapy (CBT) is an approach to relieving insomnia that involves re-training the body and mind to sleep at the appropriate and desired time. Working with a therapist, the insomnia patient will incorporate new behaviors into their daily routines and will learn relaxation techniques that target the anxiety that many with insomnia have about falling asleep. CBT has been proven effective, often more so than pharmaceutical therapy, particularly for long-term relief of insomnia. Prescription medications are often used to treat insomnia and there are a variety of types available. Benzodiazepines such as Halcion and Restoril and non-benzodiazepines such as Lunesta and Ambien are well-known examples of prescription sleep-aids. These drugs can be effective for some people, but they are also associated with some serious side-effects, including sleep walking and daytime fatigue. Users can also develop dependence on some of these medications with long-term use. Non-prescription and natural sleep remedies are also widely available for insomnia treatment. Perhaps the most well-known non-prescription sleep aid is melatonin. Melatonin is a naturally-occurring hormone and its use as a sleep-aid has been demonstrated to be effective. Other products that are available over the counter are L-tryptophan supplements and valerian teas and extracts. Many sufferers find relief with these treatments, but the research on their effectiveness is limited. Over the counter antihistamines are also used frequently for inducing sleep. Insomnia plagues many people and can take its toll on lives and relationships. But with proper attention, short bouts of insomnia can be kept from becoming long bouts and chronic insomnia can be finally resolved. Osteoporosis is a serious bone condition that results from low bone density and weakening bone strength. It makes the bones fragile and susceptible to fractures. In fact, it is considered by medical experts as a silent killer since a victim will feel no symptom of bone loss until the bones become so weak that sudden strain, bump, or fall leads to a fracture and a notable loss in height. Fractures caused by osteoporosis are usually concentrated on the hip, ribs, vertebra, and wrist. Osteoporosis is diagnosed by measuring the bone’s mineral density using a low-radiation scan. Many think that osteoporosis is prevalent among older people; however, even young people can fall prey to this debilitating illness. Studies conducted by the International Osteoporosis Foundation show that in Europe, one person suffers from osteoporosis-related fracture every 30 seconds. 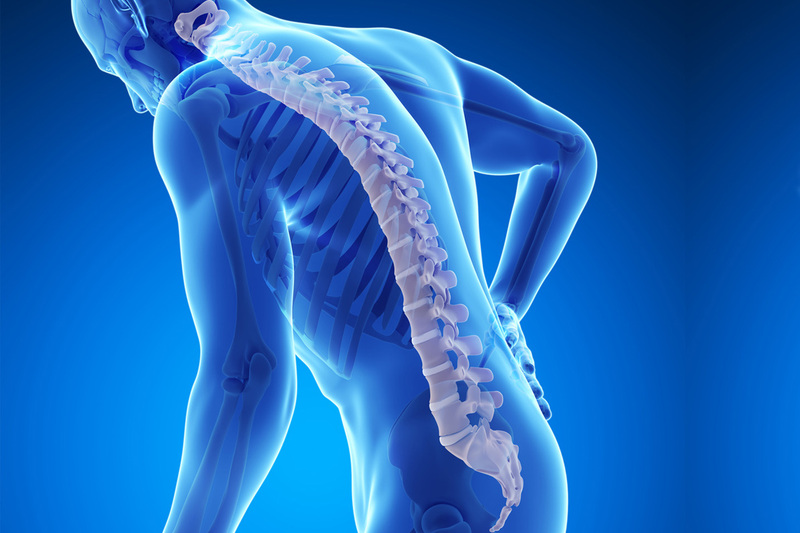 In the United States, more than 10 million people are diagnosed with osteoporosis and more than 34 million are at risk due to deteriorating bone mass. According to the U.S. National Institutes of Health, 50% of women and 25% of men 50 years old and above are prone to osteoporosis-related fractures. Furthermore, the World Health Organization warns that the number of fractures caused by osteoporosis around the world is expected to double within half a century, should there be an increase in elderly population. Osteoporosis is an ailment that should never be ignored. It results to a high rate of disability and even mortality. Almost 25 percent of patients above 50 die within a year due to medical complications brought about by fractures. Studies show that osteoporosis is hereditary and parents who suffer from hip fractures are more likely to pass it to their children. Malnutrition also hastens a victim’s risk factor. Babies whose mothers are malnourished during pregnancy are at risk of developing osteoporosis later in life. Age is another factor to consider, since older people may suffer from fragile bones. Medical conditions that show up in the later years, like Cushing’s disease, diabetes, and hyperthyroidism could also increase the chances of developing this ailment. Women in menopause are four times more in danger of developing osteoporosis compared to men. This is because the production of estrogen, which is vital is bone mass protection, is reduced. The risk of developing osteoporosis is always preventable through proper diet and healthy lifestyle. Deficiency in calcium and vitamin D will more likely cause bone deterioration, while excessive consumption of salt triggers calcium excretion. Excessive alcohol consumption and poor diet may also lead to osteoporosis. Eating disorders also brings serious consequences to the health since they leads to dietary deficiencies, decline in body weight, and absence of menstruation for women. As a result, the body stops producing estrogen, which in turn weakens the bones. A lifestyle of inadequate physical activity also hastens the development of osteoporosis. Since smoking decreases the bone’s mineral density, it also carries a significant risk. According to the World Health Organization, one out of eight fractures is linked to smoking, thus, when a person stops smoking, he alleviates his risks of suffering from fracture and osteoporosis. Preventing osteoporosis starts in childhood, when 90% of bone mass is developed. A diet rich in calcium, a nutrient necessary for strong bones, should always be prepared and consumed. Some of the main sources of calcium include milk, dairy products, such as yogurt and cheese, eggs, salmon, nuts, oatmeal, sesame seed, tofu, and fresh, green, leafy vegetables. Vitamin D is essential for calcium absorption. This vitamin, when exposed to the sun, is synthesized in the skin. According to Dr. Manuel Mirassou Ortega, a member of the Mexican Bone and Mineral Metabolism Association, sunbathing for up 10 minutes every day provides 600 units of vitamin D, which is enough to prevent osteoporosis. A diet rich in eggs, saltwater fish, and liver also provides the body a steady supply of vitamin D.
Regular exercise is always emphasized as the main tool in keeping the bones and muscles healthy. Exercise increases the bone mass during childhood and adolescence while it prevents bone deterioration during old age. Even simple exercise, such as walking, jogging, and even dancing are proven effective in keeping the bones strong. Prevention has always been said to be a better remedy than cure. And what blessings of good health and happy life come to those who make the effort in preventing osteoporosis. 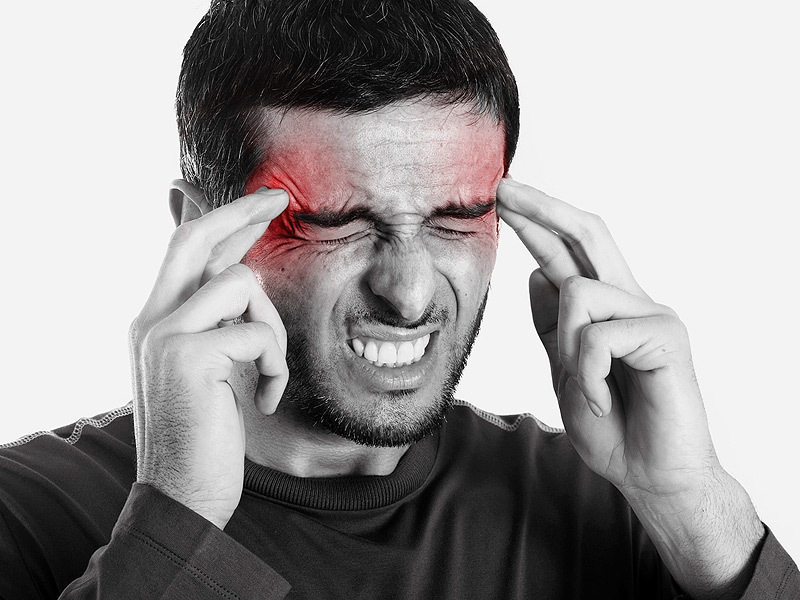 Trying to find the cause for a migraine headache is often hard. There are several factors that can trigger a migraine such as eating certain foods as aged cheese, wine or nuts. One of the main causes of migraine headaches is stress, so it makes sense to develop ways to control stress for reducing the likelihood of a migraine headache. Often migraine sufferers are significantly affected by stress. Certain types of chemicals in the brain are released during stress. These chemicals are designed to fight whatever the stressful situation is and are known as the “flight or fight” response, according to Web MD.com. When these chemicals are released, sometimes blood vessel changes can result in migraine pain. There are many causes of stress that can result in migraine pain. For example, some the most common triggers for migraine stress are life-changing events such as getting married or divorce. Having a baby is another major life change causing stress leading to migraines. Moving to a new residence is another major stressor for many migraine sufferers. Just traveling to a new environment can cause enough stress to produce a migraine. Sometimes people who are fearful of flying can easily develop a migraine headache before boarding their flight. Stress related to work or taking care of children, full time as a stay-at-home mom, can also cause migraine headaches. Women who juggle both a career and motherhood and especially single mothers are can be candidates for migraines. Migraine stressors can be due to bad health habits such as overeating, excessive drinking or smoking. Withdrawing from family and friends can also cause stress, leading to migraines. Although stress can’t be totally eliminated, migraine sufferers can take certain steps to reduce their overall stress levels. First, it’s important to identify the stressor. Sometimes, this is difficult because the true sources aren’t always obvious. For example, a stressed person may be continually worried about meeting deadlines, but not realize it’s actually his procrastination habit that causes the stress rather than an actual deadline. Identifying a source of stress involves carefully examining bad habits, as well as excuses and attitudes. Eating a well-balanced, healthy diet is part of reducing stress. Besides a eating the right foods, sometimes people are deficient in important vitamins and minerals, such as vitamin D, which has been linked to migraine headaches. It’s also important to get regular physical examinations, along with blood tests to determine any problems of vitamin deficiencies. Getting regular physical exercise helps reduce stress. Practice relaxation techniques. Often stressed people never take time to just be by themselves, doing nothing. Prayer and meditation are excellent ways to help lower stress. Getting adequate sleep helps lower stress. This may mean going to bed earlier. Keeping a stress journal can help with identifying regular life stressors. Besides recording stressors, it also helps to note ways that the stress was handled. Finally, it’s critical to take responsibility for any part played in producing stress, besides maintaining a less stressful life. Those who continue to blame others for their stressful lives without taking any role themselves will continue to be stressed and fail to find relief from migraine headaches. The sooner a migraine sufferer starts improving stress levels, the quicker the pain will begin to lessen.